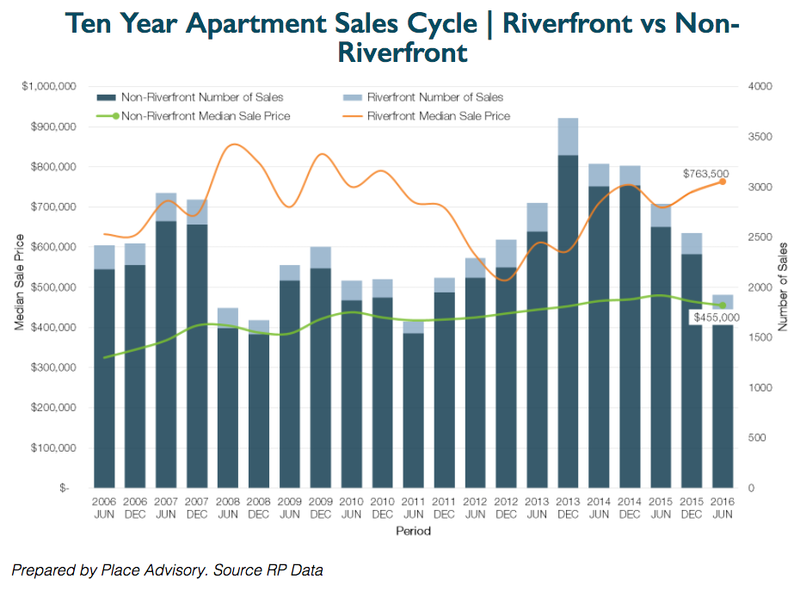 In the six month period ending June 2016, riverfront apartments recorded an average sale price of $763,000 which was 68 per cent more expensive than the non-riverfront apartment average of $455,000, according to Corelogic data prepared by Place Advisory. 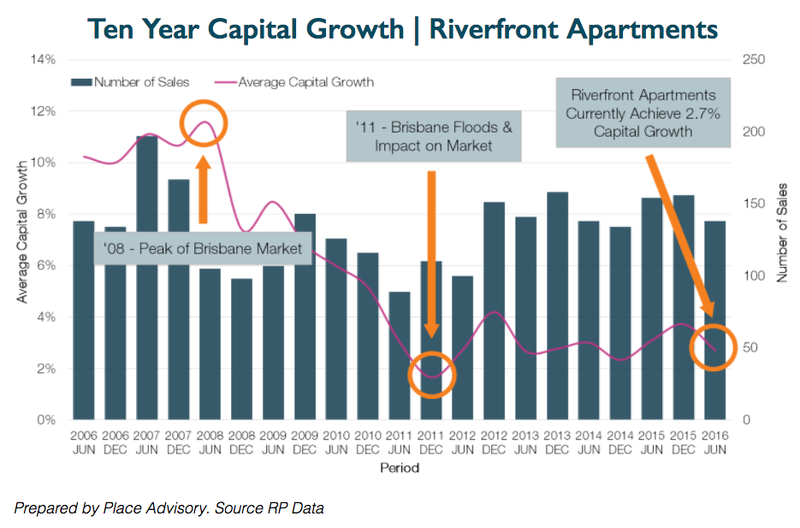 But while Inner Brisbane's riverfront apartments command a near-70 per cent premium entry into the market, the research shows there's actually very little difference in terms of capital growth achieved between the two markets. Riverfront apartments achieved 2.7 per cent capital growth in the six months to June 2016, down from 3.1 per cent in the previous six month period, whereas non-riverfront apartments achieved 2.4 per cent capital growth, down only slightly from their waterfront counterparts. Pre-GFC, the biggest price difference was in the six month period ending June 2008 where the largest price difference was seen with riverfront apartments 110 per cent more expensive with a median price of $880,000. 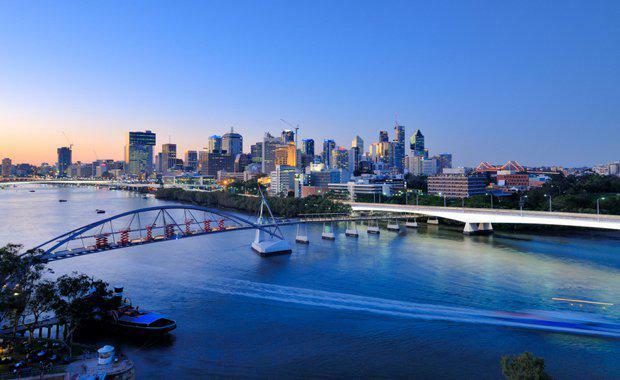 The most recent six months ending June 2016 saw the riverfront apartment market reach 162 transactions representing 4.8 per cent of all apartment transactions in Inner Brisbane. But when it comes to luxury living, unsurpassed views, and resident amenity, luxury riverfront apartments claim victory. 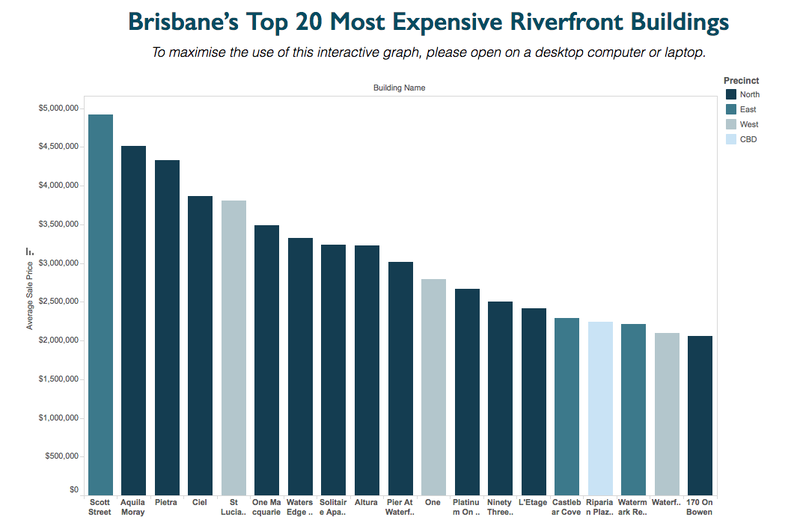 The chart below shows the top 20 most expensive riverfront apartment buildings in Brisbane over the past 10 years. Kangaroo Point's Scott Street apartments recorded the highest average apartment price of $4.9 million over the past 10 years. New Farm’s Aquila Moray apartments came in second recording an average sale price of $4.5 million. The majority of Brisbane’s top 20 riverfront apartment buildings are located in the North of the River precinct, with all except two buildings being located in New Farm.